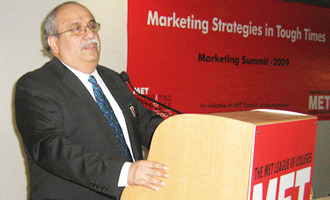 MET Schools of Management organised a Marketing Summit on October 30, 2009. The theme of the meet was “Marketing Strategies in Tough Times”. The invitees for the meet were veterans from the industry, who shared their valuable experience in form of a Panel Discussion. teachers and other faculty. teachers and other faculty.